In between some aged row houses and the highway sits a psychedelic-looking structure called Blind Whino. Initially, I heard about it from an online post, which detailed its whereabouts and a couple of other key features of the structure. Apparently, it was home to an arts collective, a gallery, a community garden, and a few eclectic events spaces. Its website stated that it is open from 12-5 on weekends. What would I actually find there? I had no idea. Other than this and the Blind Whino website, there wasn’t much else about it on the Internet. I didn’t see it on any list of things to do in Washington DC. It was as if this strange structure was a secret garden in the city, waiting to be discovered. In short, Blind Whino was intriguing. Very intriguing. 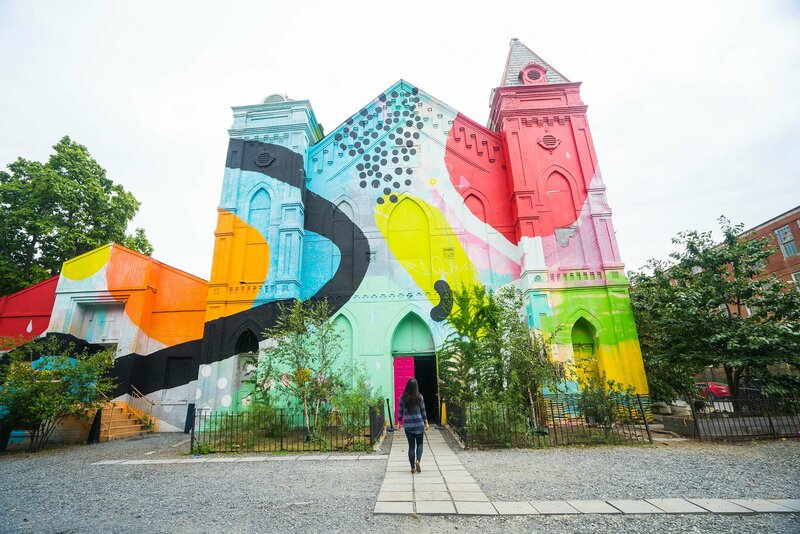 Blind Whino is an arts facility located in a repurposed historic church in Southwest DC. The structure was originally a Baptist church that served the local community. After a developer bought it out, it sat vacant for over 20 years before Atlanta-based painter Hense was commissioned to beautify it. Founders Shane Pomajambo and Ian Callendar created what is now known as Blind Whino, a nonprofit art and performance venue open to artists and community members from around the city. Each month, the gallery annex features a new and exciting art exhibit, which is open to the public on select weekdays and weekends from 12-5 PM. On a Sunday afternoon, I decided to check it out for myself. When I arrived at Blind Whino, I couldn’t exactly understand what I was looking at. On the outside, it looked like a boarded up church that fell into a vat of pixie dust, tie-dye, and Instagram filters. There wasn’t an inch of outdoor space that wasn’t some crazy combination of colors. Much of the lower areas of the building were overgrown with all kinds of plants. Upon second glance, I saw a chain link gate towards the front of the structure. As we entered the premises, we finally found the front door, which was ajar. After we entered the building, we headed towards a well-lit hallway, where we found the gallery exhibits. An exhibit carrying the namesake of the black and white mural, “Superfierce,” was in session. The Superfierce exhibit had a variety of pieces, all centered around feminism and powerful women. As a woman, I loved the strong message the exhibit conveyed. The art displays were sassy, vibrant, and in-your-face. In short, there’s only one way to describe my reaction: obsessed. If you’re interested in checking it out, the Superfierce exhibit runs until late October or early November. When I visited, there weren’t too many people there, which made for a really laid-back and pleasant experience. I’ll definitely be back to this unique venue in the future for different exhibits and events.